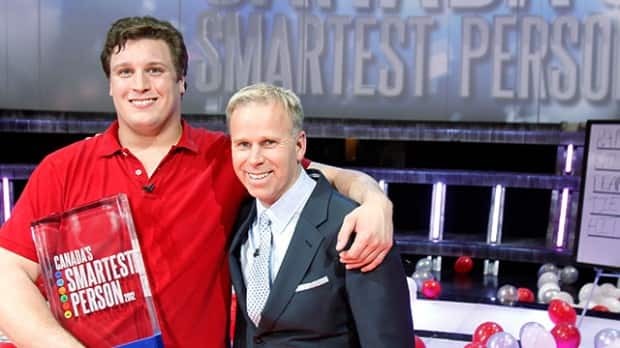 Peter Dyakowski is a world-class athlete (he's an offensive linesman for the Hamilton Tiger Cats) and he is currently Canada’s Smartest Person. A: I am an Aries. I like cats. I love coffee-making devices. I am very good at going to the store and not buying things. I am also very good at selling things. I love musicals and I sing a lot at home and in the car. I would like to join a neighbourhood theatre troupe. Max bench press is 500 lbs. Max squat is 600 lbs. Max clean is 374 lbs. 10 yard dash in 1.68 seconds (electronically timed) and 40 yard dash in 4.87 seconds (hand-timed), weighing 320 lbs. A: I was already quite active in and around Hamilton with pro-reading programs and several other education initiatives and I have been doing even more since the show! I am also now one of the owners of the Oxford Learning Centre in Hamilton where I will even teach the odd class with some of our younger students! As I mentioned earlier, I used my newfound confidence with the ladies to help land myself a bride (the most beautiful girl in the Golden Horseshoe/Southern Ontario). And, of course, I've played a lot of football! I managed to get voted onto the CFLPA All-Star team in both 2012 and 2013 and this past season I became a Grey Cup silver medalist! Q: When you entered the competition in 2012, did you think you had a shot at being a finalist? A: Not really, I entered just for the fun of it! Q: Did someone encourage you to apply? A: Yes and I'm darn glad he did! A friend encouraged me to apply since I had done well on a previous CBC challenge program, Test the Nation, in 2010. A: It was a lot of fun! I met some really interesting people and I got to be a part of a television broadcast that didn't involve football! I also learnt that, under the correct circumstances, when the planets have aligned and the moon is full, I can do some impressive things! 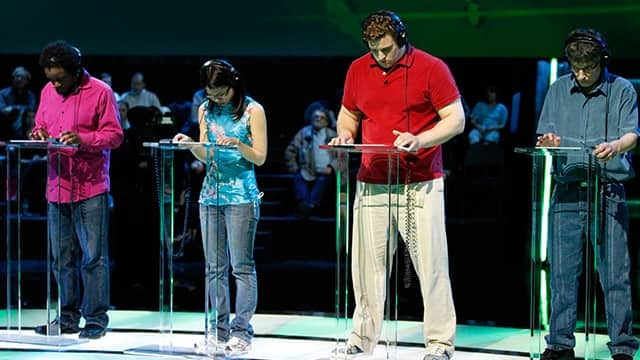 Peter with the 2012 Canada's Smartest Person finalists, concentrating hard on a musical challenge! A: I think it's a tie between logical and linguistic for me. A: Social. When I'm hot, I'm hot, and when I'm not, I'm not! A: Everyone! Except for cats. They lack the necessary attention span needed to focus for long enough to win. But everyone else should apply! If a football player can win, then so can YOU! Q: Any advice for this year's applicants? A: Get a good night's sleep beforehand, eat a big breakfast, snack between challenges, and don't worry about losing. Just have fun!. Stay mentally active in the lead-up to the show. Play a lot of board games and try to work under a bit of pressure. Also, positive self-talk is huge - say encouraging things to yourself daily. 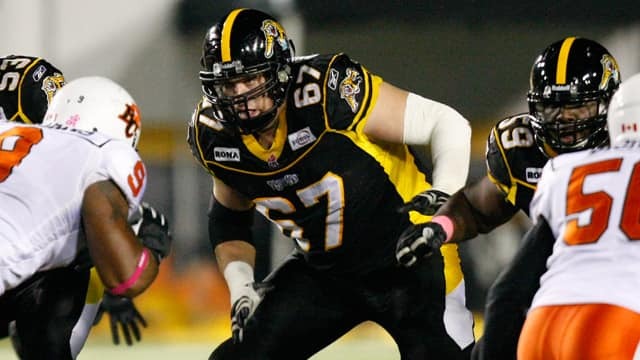 Peter playing in the Canadian Football League with the Hamilton Tiger Cats.